Bordentown, NJ – April 24, 2008 -– Two weeks ago, Nikolay Davydenko put together a string of wins at the Sony Ericsson Open beating Andy Roddick and Rafael Nadal en route to capturing the biggest title of his career. His play on court, combined with the romantic story of how he switched from the Ozone Tour to the denser string pattern of the Ozone Pro Tour prior to his first round match, and how he used the same frame to march through the draw, are becoming something of tennis lore. His results and outspoken affinity for his “new” O3 racquet, have not only led to a surge in his popularity but created a noticeable spike in demand for the racquet as well. 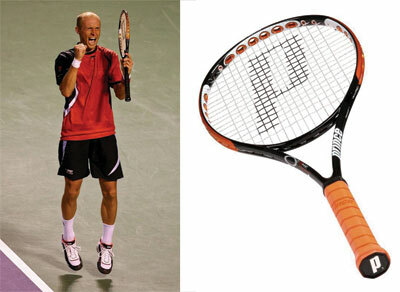 Davydenko playtested the Ozone Pro Tour between the Pacific Life Open and Sony Ericsson Open and liked the feel of the denser string pattern immediately. He went into the tournament with a couple of the new racquets in his bag but favored one frame in particular and stuck with it throughout the tournament. During the trophy presentation, Davydenko told on-court reporter Mary Joe Fernandez that he would “keep this racquet forever”. While he may feel differently as Prince introduces him to newer models moving forward, what is for certain is that his decision to pick up the Ozone Pro Tour, with its 18 x 20 (denser) string pattern, coupled with his championship run have proved to be an extremely positive combination for a Prince brand that is already seeing strong growth and momentum in the market. With the win, Davydenko became the first Russian ever to win this prestigious event. In speaking openly about how comfortable he was with the Ozone Pro Tour, Davydenko piqued the interest of players globally, continuing the buzz around Prince’s visible O3 racquet technology. Today, there are over 100 touring pros using various racquet models with O3 technology, and nearly everyone who has made the switch to an O3 frame has improved his or her ranking. Following his win in Miami, Davydenko then went on to reach the finals of the clay court tournament in Estoril, Portugal. More recently, at the U.S Clay Court Championships in Houston, Texas, in only his eighth ATP event, Marcel Granollers-Pujols won his first title, using the Ozone Tour to beat James Blake and move his ranking from #84 to #54.